Confirmed Responder… someone pinch me! It’s taken a weekend of recovery and trying to grasp my news in order to write this. I don’t think it’s sunk in yet. Perhaps it won’t until I have a copy of scan results I can hold and reread in 9 weeks. In any case, as I try to grasp hope that feels so slippery, here is the story of Thursday! I got to the cancer center and had my port accessed and 10 vials of blood drawn. I then had my pre treatment EKG and was complimented on my aura of peace and calm by the PA administering the EKG. She was very sweet and has clearly never seen me on a scan result day! After the typical LONG wait to see my oncologist, he came in and noticed I’d lost weight (always a nice way to begin an appointment, right?) Then asked if I’d noticed a difference in my tumors. I told him yes and smiled and he GRINNED the rest of the appointment! He listened and didn’t even laugh when I described my odd method of measuring my tumor with my hand. He than did my physical and right away when he looked at my groin tumor confirmed “It is definitely smaller.” The rest of the appointment was a bit of a blur because I was SO excited! Dr C told me I was a responder to the drug and told me how nice it was to have such a positive appointment with me. Just one dose and I am a responder!?! I can’t even describe the emotions that came with that statement. I was SO excited! Talk about steriods here I headed upstairs to wait to get called back to the research infusion room to recieve dose two of Anti-PD1. I called Danny while I waited to share my incredible news! My drug seems to take a LONG time for the pharmacy to prepare. My research nurse gave the pharmacy the heads up to begin preparing the drug and we filled out some research paperwork about side effects and how I am feeling while I waited. After about a hour wait, I was called back to the research infusion area. I was given my premeds and we began the 30 minute wait (can you tell days at the Cancer Center involve a LOT of waiting?) for the meds to work and crossed our fingers that the medication would arrive before I was due to take them. The infusion room had friendly patients and support people who celebrated with me when I told my infusion nurse that the drug was working! I wish I could tell those folks how much it meant that the celebrated with me since I was alone for my infusion and just bursting with excitement! My drug arrived just in time and I began my 30 minute infusion before heading home to celebrate with the family! Praise God! Last week I taught a lesson about sun safety and sunscreen application for my Mom’s second and third grade students . It was fun for this former teacher to get back into the classroom and talk about something I am so passionate about. Since that lesson went so well, and I recently purchased a children’s book about Melanoma and sun safety written by a fellow Melanoma warrior, I offered to teach a similar lesson in my children’s first and second grade classes. Today I taught in Joey’s second grade class. Joey loved being the model for me to demonstrate sunscreen application. I think the kids learned a lot about sun safety and proper sunscreen application. I didn’t focus on the best type of sunscreen to wear, because most second graders don’t have a lot of influence in their parents purchasing decisions, but instead I showed them tips for best applying stick, lotion, and spray sunscreens. We also talked about how important it is to reapply sunscreen and wear hats and sunglasses. I also discussed how to politely share what they learned with their parents. I sure hope that part got through! I am dreaming about how to expand teaching sun safety to more elementary age students. I want to make hats available for students to wear on the playground. I’ve been doing lots of thinking about the best way to make this happen. Ideally we would raise money for hats and educational materials. Do we form a foundation? Do we create a non-profit? Is a non-profit the same as a foundation? Do I try to work with an existing organization such as the Skin Cancer Institute? It sure is fun to dream about the possibilities! What spray sunscreen do you recommend for kids/sensitive skin? I get asked this a lot. I understand the draw of spray sunscreens. They are SO quick and easy! But, I can’t recommend any spray sunscreens. To be clear, I am meaning spray sunscreens in an aerosol or compressed air form, not the sunscreen with a pump spray. Almost all spray sunscreens are chemical based. I am very concerned about the long term effects of chemicals that may be inhaled while spray sunscreens are applied, especially for children who may not be able to hold their breath as reliably as we would like to believe. My 8 year old son told me last week that he’d been holding his breath for 15 minutes (he wrote me a note to tell me.) I told him to plug his nose and he lasted about 4 seconds. He genuinely thought he was holding his breath before. It made me reconsider just asking him to hold his breath when spraying him with sunscreen! I wouldn’t recommend sprays for sensitive skin. Almost all contain denatured alcohol which is horrible for skin! Drying and irritating. Sprays are also infamous for not providing compete coverage. The chemical forms that go on clear are extremely difficult to check coverage. So, I still haven’t talked you out of using a spray sunscreen? That’s alright! I won’t judge you if I see you spraying your kids down at the pool or the park! I know sprays are easy. ANY sunscreen is better than NO sunscreen! May I offer a few tips about applying that spray? 1. READ and FOLLOW the directions on the bottle. Chemical sunscreens need to sit on the skin for 20-30 minutes before the sunscreen begins working! 2. Spray until you can see the sunscreen on the skin. This is the only way to make sure it hasn’t all blown away in the wind! 3. RUB it in. ALL sunscreens need to be rubbed in! tive ingredients (as in all mineral sunscreens) are zinc oxide and titanium dioxide. If you try it make sure you shake it and it should spray white. The first three times I sprayed this on my screen, it came out clear. I don’t believe I got any protection during any of these applications. Yikes! After shaking it comes out super thick and is tough to rub in. I didn’t like it much, but if you really want to try a spray, I’d recommend Goddess Garden Continuous Spray SPF 30. May is Skin Cancer Awareness month. The first Monday in May is set aside as Melanoma Monday. Melanoma is the most common cancer in 25-29 year olds. I was diagnosed when I was 29. Melanoma is deadly and the rates of Melanoma diagnosis are rising at an alarming rate. 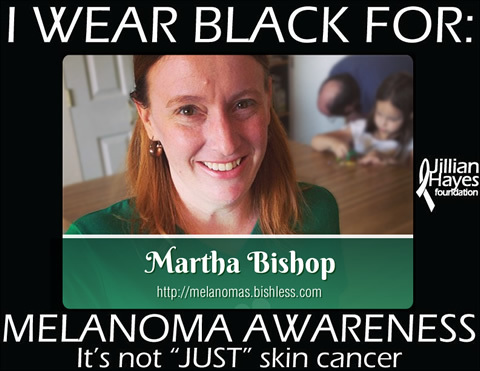 One phrase that is common in the Melanoma world is “Melanoma is not JUST skin cancer.” Melanoma is deadly because it grows within the body and spreads like wildfire. I have battled Melanoma on my skin, in my lymph nodes, in my lungs, and in my brain. Tomorrow I will be wearing black along with my sweet family and many friends to raise awareness of this deadly cancer. I will be wearing black for me, but also for the 492 warriors and support people in my online support group. I am also wearing black in memory of Amy, Al, Jackie, Steve, Jen and Jillian. I would be honored if you would join me in shouting Mela-NO-mas! tomorrow by wearing black! The American Academy of Dermatology decided to make wearing orange their rally cry for Melanoma Monday this year through their Spot Orange campaign. I am not sure of their reasoning behind the change from black, because the Melanoma ribbon is black, but I would be honored equally by anyone who wears orange or black tomorrow for the purpose of raising Melanoma awareness. I would LOVE for you to join me in wearing black tomorrow! 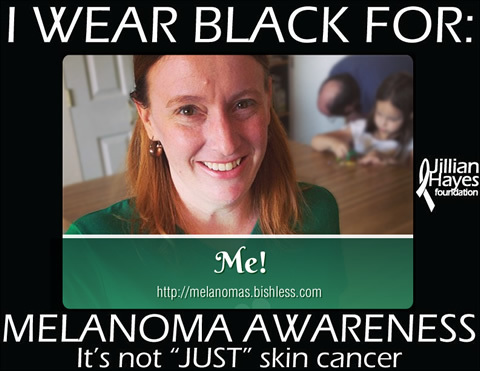 Danny created an image for me using the Jillian Hayes Foundation’s frame to share why you are wearing black. If you would like, I would be so honored if you would share this image with others!